Sweden’s Timmy Hansen set the fastest time in Q4 at the World RX of Great Britain to end Norway’s Petter Solberg’s runs of fastest times at the fifth round of the FIA World Rallycross Championship. Hansen took the joker lap early in his race and won on track to be fastest, as in the last race of the Q3 session Johan Kristoffersson beat his team mate Solberg for the first time of the weekend, Kristoffersson second behind Hansen in Q4 with Solberg in third. Solberg is top qualifier at the Intermediate Classification and as a result will start on pole position for semi-final one this afternoon while Kristoffersson will start on pole position in semi-final two. Hansen’s Q4 time means he moved to third in the Intermediate Classification and will join Solberg on the front row for semi-final one, Kristoffersson joined by his countryman Mattias Ekstrom on the first row for semi-final two. Ekstrom who was eighth fastest in Q4 after a battle with Sebastien Loeb, the nine-time World Rally Champion will start on the second row of the same semi-final race, next to MJP Racing Team Austria’s Kevin Eriksson and in front of Latvia’s Janis Baumanis and Finland’s Topi Heikkinen. 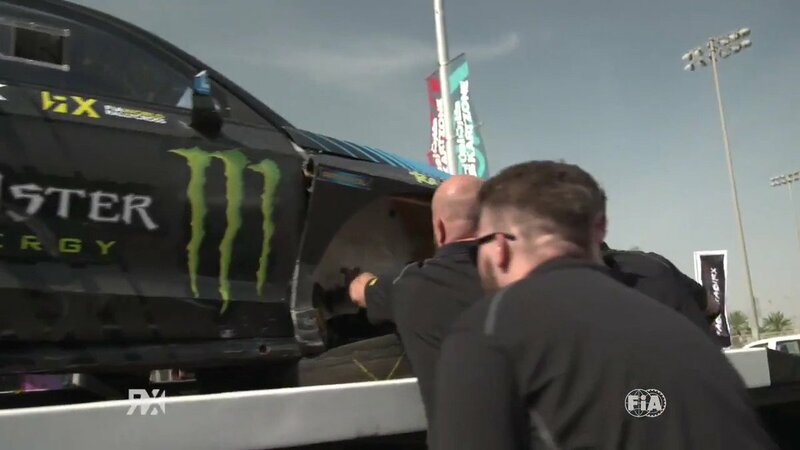 Hoonigan Racing Division team mates Andreas Bakkerud and Ken Block were fourth and fifth in Q4 and start together on row two of semi-final one, with Andrew Jordan and Timur Timerzyanov also making it into the top 12 to join the semi-final one grid on the third row. Reigning FIA European Rallycross Champion Kevin Hansen, who is celebrating his 19th birthday today at Lydden Hill, was ninth fastest in Q4 but just missed out on a place in the semi-finals due to technical problems yesterday.